F-number of a camera lens is the ratio of the focal length to the diameter the effective virtual or real opening which limits the incident light to camera. With a camera lens with an adjustable aperture the amount of light needed for correct exposure can be selected from Camera’s control panel. The largest and smallest adjustable aperture could be set depends on the design of each lens. Where, f = Focal Length, D is the diameter of the effective aperture. 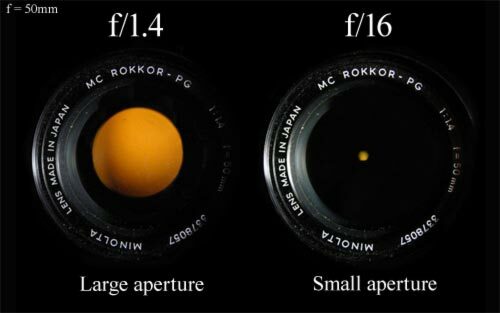 Typical aperture series of lenses for small format cameras start from 1.4 to 5.6 (maximum aperture) and go in steps of factor (approximately 1.41) up to 16, 22 or 32. For large format cameras (at least double image size as 24×36 mm full frame DSLR image sensor), the f-number typically start at 4, 4.5 or 5.6 and go to 45, 64 or even 90. Small f-number allow shorter exposure times, small apertures (large f-number) result in greater depth of photography. The sharpness of a given photograph varies with f-number too. As optimal f-stop value changes with various lens this is a characteristic feature. Most of the lens from good manufacturers, usually has 6 to 7 elements, in an test situation sharp but perfect Photograph is obtained around f/5.6“f/8 (by formula), while sub standard lenses has 4 elements or sometimes less will need higher f-number to compensate. The reason behind this f-number compensation is the optics of diffraction. As , most do not uses even a full frame DSLR, one can practically forget about double image format size, as the size of sensor is decreasing, there is always few extra points to be remembered simply because all the lens are manufactured for a full frame camera. This is the reason why there is a great improvement of image quality with after market lens with lower F-number. This Article Has Been Shared 904 Times! Cite this article as: Abhishek Ghosh, "F-number in Digital Photography," in The Customize Windows, July 1, 2012, April 20, 2019, https://thecustomizewindows.com/2012/07/f-number-in-digital-photography/.